KayKiSpeaks.com: Hundreds dead from earthquake in Turkey, baby girl makes it out! 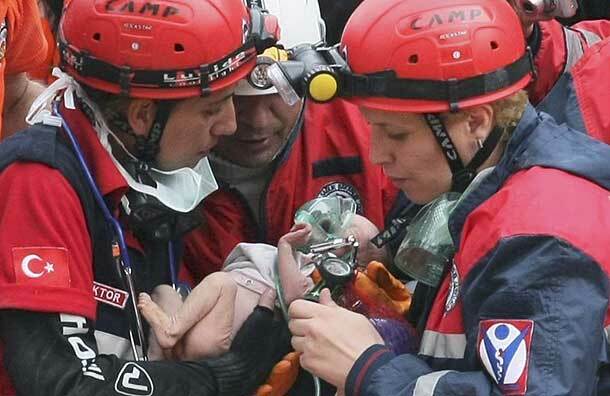 Hundreds dead from earthquake in Turkey, baby girl makes it out! While news of natural disasters around the world compels us to believe the world is soon coming to an end, there was a spark of hope in the aftermath of Sunday’s earthquake in eastern Turkey. 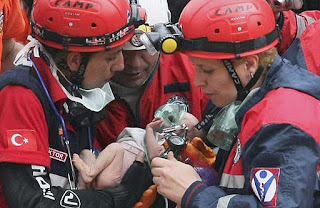 After 48 hours, a 2-week-old baby girl was pulled from the rubble of a toppled apartment building, half naked but alive, according to Associated Press reports. Rescue workers cheered and applauded at the sight, and again hours later as the baby’s mother and grandmother were pulled out. The baby was taken to the hospital in healthy condition. The death toll from the 7.2-magnitue quake rose to at least 459. Strong aftershocks caused widespread panic, leaving thousands without homes struggling in cold temperatures. Turkey is accepting international offers even from Israel, with which it has had strained relations. At least 1,352 are injured and nine people have been rescued, according to TRT, a Turkish television station. Turkey lies in one of the world’s most active seismic zones and is crossed by numerous fault lines. In the midst of tireless celebrity news, sad economy stories and ever-evolving health developments in vaccines (HPV vaccines for teenage boys), keep the people of Turkey in your thoughts and prayers.